It turns out that he chose China as the preferred location for his Art Farm because the Chinese have never exercised the type of animal rights standards that are generally deemed even minimally acceptable compared to what is practiced in other countries around the world. Apparently, I've been hiding under a rock for almost two decades because I only just recently caught wind of what's been going on at artist Wim Delvoye's Beijing based Art Farm since the early 90s. First, it might be helpful to understand that the man is a native of Belgium -- Ghent to be specific (yes, the same town that claims to have more veggie restaurants per capita than in all of Europe). He also happens to be a self confessed vegetarian, which is not unusual for a European resident or an artist in particular -- creative minded characters tend to be more empathetic toward all creatures great and small. 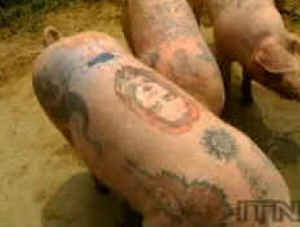 One might naturally wonder why, then, Delvoye has commanded an entire staff of master tattoo artists to ink live pigs on his China-based farm. That seems completely incongruous with the belief system held by many meat eschewing individuals who feel that animals should never be viewed as property, food, entertainment, research subjects, or as clothing, for that matter. It could be easily surmised that Delvoye believes that his definition of "art" is exempt. It turns out that he chose China as the preferred location for his Art Farm because the Chinese have never exercised the type of animal rights standards that are generally deemed even minimally acceptable compared to what is practiced in other countries around the world. With no one breathing down his neck, he has been able to operate a rather lucrative business in which a staff of local farmers supplies and feeds an ever plentiful array of pig residents that will become the tattooed canvases that he ultimately uses as inanimate art works and luxury goods. The unwitting porcines are purportedly sedated prior to going under the needle (although the video below suggests otherwise), inked with a combination of diverse artistic scenes and couture fashion house logos by a collection of locally revered tattoo artists, allowed to grow to a prerequisite Rubenesque size and then finally slaughtered for their ultimately valuable skins. Delvoye claims that he's been pulled toward the "agrarian tradition" in Flemish art his whole life, so I can't help but be more than a little perplexed. Agrarianism is a social and political philosophy espousing the joys of living a rural or semi-rural lifestyle via farming, raising animals and achieving balance through a more sustainable lifestyle. How do his tattooed pigs -- many of which bear the status logos emblematic of our seemingly incurable addiction to consumerism -- represent a return to the simple life? What is it about a Louis Vuitton embossed pig that screams, "I heart Mother Nature?" When cashing the triple zero paychecks offered to him by the rich and the famous (many of which make shopping and collecting their main pursuits), I wonder what percentage he offers to his worker bees back in Beijing? Does this jet setting artist of international renown really do anything to embrace the agrarian tradition other than to get a staff to do his dirty pig rearing/inking/and killing business for him? While I'm a huge fan of art, this is one time when I see nothing but animal cruelty and pure profit emerging out of this endeavor. Oddly enough, he's apparently an equal-opportunity tattooer, recently earning an astounding $233,025.01 USD by inking a Swiss man who will ultimately 'donate' his skin as art -- at least, that's what they're contract says. Consenting humans is one thing...a little warped perhaps, but it's true that there are different strokes for different folks. Pigs, however? The only way that I see the sacrifice of Delvoye's pigs truly honored is if he paid for their porcine family members to be given a one-way, first class ticket out of the Art Farm and onto legitimate pastoral farmland owned by a rescue organization.